Hilton Head Island, S.C., conjures up thoughts of relaxing getaways at coastal resorts on beautiful beaches. 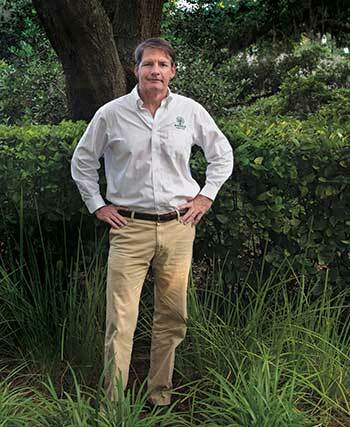 For The Greenery’s CEO, Lee Edwards, Hilton Head Island has been about the people and the relationships that have helped his company grow from a small family business with six employees to where it is today—a company that is poised to make $65 million. The Greenery is celebrating its 45th anniversary this year as well as its 10th year under an Employee Stock Ownership Plan (ESOP). Under this plan, the company’s 806 full-time employees share in the growth of the $65-million business. “We’re in our second generation of ownership, and it’s been 10 years of success now, so that’s something we’re very excited about,” Edwards says. Ruthie and Berry Edwards started The Greenery in 1973 with the purchase of a small nursery retail space on Hilton Head Island. “The 1970s and early 1980s was when Hilton Head was really being developed a lot,” Edwards says. Resorts began dotting the coast, and Edwards’ parents saw the need for a landscape company in the booming vacation community—and the opportunity to scale up and meet that demand. Today, the company has grown to 14 branches, completing both commercial and residential maintenance and construction, on the coast of South Carolina and in Savannah, Ga. 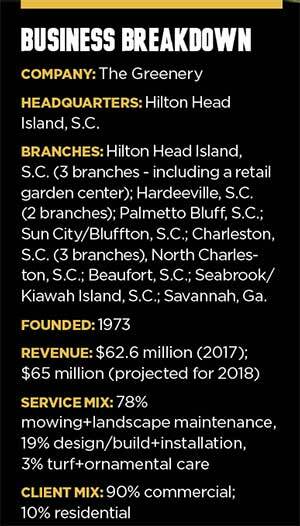 The company still operates a retail center on Hilton Head, and it does $1.7 million in business. When The Greenery was just starting out, Berry Edwards hired a few landscape architects, who then built relationships with the developers of some of the local resorts. 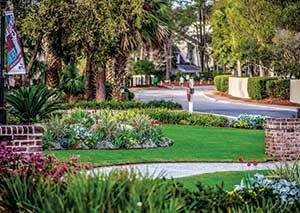 The large resort clients and residential communities in South Carolina have proven to be lucrative relationships for The Greenery and have been clients for years. The mid-1990s saw increased development off of Hilton Head. Sun City was an age-restricted retirement community consisting of 8,000 homes, which spurred other development on the island. The Greenery was a part of the Sun City development from the beginning and to this day covers maintenance for the 14,000-acre community. The Greenery added other residential communities to its construction and maintenance roster, such as the 2,600-acre Savannah Quarters, which includes 1,000 residences and even larger communities, such as Daniel Island and the 20,000-acre Palmetto Bluff project. Part of maintaining these major relationships over the years is being flexible and collaborative, especially when some of its long-standing clients experienced some financial problems. Edwards says that during the 2008 recession, a few of The Greenery’s clients, including Savannah Quarters, explained that their accounts would have to go up for bid. “We said, ‘Wait, wait, wait—we’ve been here with you through the good times, and we’ll be here for you in the bad times. Let’s figure out what your budget is and we’ll figure out a way to meet it,’” he says. The Greenery went to its other clients with the same message, and Edwards says those clients appreciated the proactive gesture. Unfortunately, Edwards’ company hasn’t been immune to economic downturns either. The company also moved staff around to different departments. Though it wasn’t welcome news that companywide pay cuts and changes were on the horizon, Edwards says people were thankful they still had jobs, and The Greenery lost very few team members during the recession. As Berry Edwards approached retirement, he began to look for a way to reward his team, especially those who had remained loyal when times were tough. Establishing The Greenery as an ESOP helped accomplish this goal. Ninety percent of The Greenery’s business is commercial, but it’s the residential side of the business that is unique. It caters to 700 residential clients on Hilton Head Island and 140 in nearby Palmetto Bluff and will bring in approximately $5 million this year. Residential is challenging, Edwards acknowledges. He credits the company’s ability to scale residential to his team providing a superior quality of work and creating good relationships with clients. A significant change was made to the residential production process over the last year. “We used to have an account manager do everything—he was the client’s sole contact, and he would deal with the crew—and the enhancement crew, the irrigation guy and the chem guy, and so on,” Edwards says. Finding account managers who were up to the task of communicating with clients as well as training and managing field crews was difficult. And what if the account manager left the company, was promoted or changed roles? Then a new employee would face the steep learning curve of becoming acquainted with new properties, clients and crews. Over the last year, The Greenery has moved to hiring account managers whose focus is the client and production managers who are in charge of training and managing the crews. The account managers and production managers work in tandem to ensure that clients’ needs are properly communicated and their jobs well executed. Aside from this strategic change in the production structure, the company has gotten creative in other areas. When it comes to filling out its staff, rather than using the H-2B visa program, like many large landscape firms, The Greenery began recruiting in Puerto Rico three years ago. Since Puerto Rico is a U.S. territory, Puerto Ricans are American citizens and don’t require visas to work in the U.S. The company recruits in Puerto Rico independently. It repays the cost of airfare to South Carolina for workers and provides housing for the first six months of their employment. “In fact, on Hilton Head, where the housing market is so difficult, we actually went and bought a bunch of condominiums so they can live there. We take care of the housing and transportation,” Davoli says. According to Davoli, the Puerto Rico recruitment has proven to be very successful, and the new crew members have been beneficial to the team. Since the beginning of the recruitment program, Davoli estimates that 75-80 out of 120 total workers have remained with the company. “We’ve had a lot of guys that have come here thinking they might want to be seasonal, but they end up staying and working for us permanently,” he says. Most of the new workers typically move out on their own after six months and bring their families from Puerto Rico to live with them. With The Greenery’s commercial sector thriving, a solid residential maintenance division and strategic plans for hiring workers in place, Edwards is looking ahead to the future. The company has been growing at a 7 percent clip, but Edwards hopes that it grows at 5 percent per year moving forward. This would allow The Greenery to achieve manageable and sustainable growth, without growing beyond its capabilities and becoming less profitable. He says the company likes being on the coast of South Carolina, but would like to open another branch outside of its current footprint in the next few years. The ultimate goal would be to eventually cover the whole state. Aside from expansion and ensuring the company remains profitable for its employee-owners,The Greenery’s purpose statement drives the work and the team. 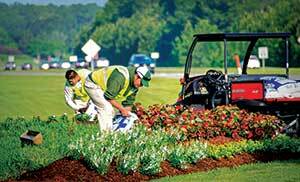 “Enhancing people’s lives through beautiful landscaping—that’s why we do what do,” Edwards says. The core of that purpose statement means that the people behind The Greenery work for themselves, each other and their clients. The Greenery’s growth and emphasis on profitability has brought about changes in other areas of the business, such as equipment. He says that the stand-on mower gives workers a better perspective on their production and provides a better-looking cut. 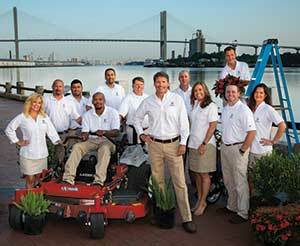 Over the course of three years, The Greenery has switched out almost all of its ride-on mowers to Wright X Series stand-ons. The company also has changed its trucks. “We used to use all Ford F250 pickup trucks and now we’re rolling out all four-door F350s as the production truck, and they actually support the hauling capacity (better),” says Davoli. According to Davoli, the switch to Stihl battery-powered equipment has been an additional change that’s been beneficial for workers and customers.